Striker has 5 goals in 7 games for Eagles. 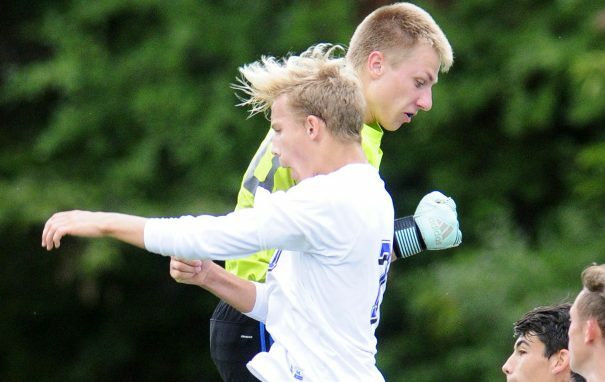 Michael Sprague offered glimpses of the type of difference-maker he could be for the Erskine Academy boys soccer team last season. This year, as a senior, Sprague looks every bit the player who was seen in flashes a year ago. Sprague, a striker, has five goals to help the Eagles out to a 6-0-1 start in the Kennebec Valley Athletic Conference. Sprague has been getting plenty of minutes, and he’s responded by finding the right spaces and right times to shoot. He has a rocket of a right foot, something that has been as lethal from 20 yards out as it has been from tight range. Sprague wasn’t the player he’s blossomed into even as recently as last spring. First-year coach Carrie Larrabee said it’s been a rewarding work in progress. “It probably started this summer,” said Larrabee, whose team will travel to Maranacook for an early season matchup of unbeatens on Thursday night. “I think that sometimes as a coach we kind of connect with kids when we played that position. Michael is a great example of that. I was kind of a striker, so I get it. I’m wired that way. There is a philosophical difference at Erskine this season, too, with Larrabee bringing a more attack-minded approach than previous coach Phil Hubbard employed. Sprague said it’s something that’s certainly helped him. Until Tuesday’s 2-2 draw with Waterville, the Messalonskee girls had gone scoreless on corner kick chances this season. Those fortunes changed against the Purple Panthers, with the Eagles (4-1-1) scoring on each of their two corner kicks in regulation. The role of junior midfield Edin Sisson, who takes the corners just as she did a season ago, hasn’t changed. What has changed is her target on the other end. Against Waterville, Lauren Pickett and Elena Guarino punched home Sisson’s services. The Eagles are looking for others to fill the void Calkins left when she graduated. But, Stansfield points out, there is a price to be paid for finding the goals. The Monmouth girls are out to a fast start, both figuratively and literally. The Mustangs (5-1-0) have been all about speed, and they trail only unbeaten Oak Hill (7-0-0) atop the Mountain Valley Conference standings as the season reaches its midpoint already. Against rival Madison on Saturday, all three of those girls had goals, with Fletcher scoring twice. Senior striker Avery Pomerleau is nearing the school goal-scoring record for the Monmouth boys, needing fewer than 25 goals the rest of the way to eclipse the old mark. But no less important to the Mustangs (6-0-0) has been fellow senior Bradley Neal. Neal was at his best this season in a 3-2 overtime win over Hall-Dale last week, making 13 saves against the Bulldogs, including eight in the first half to keep Monmouth within striking distance. Junior Hannah LeClair has turned into exactly the kind of supporting player the Waterville girls were looking for to complement senior Mackenzie St. Pierre and junior Anika Elias in the attack. LeClair scored her third goal in as many games against Class A Messalonskee on Tuesday. LeClair said she wasn’t nervous about playing a Class A team for the first time in her career, and she showed it by scoring the only goal of the first half. Winslow senior Jake Warn missed only one game this season after being diagnosed with a broken foot, scoring against Mount View in his return… Temple has allowed only five goals in five games this season, four of those in two combined meetings with Islesboro… The Maranacook boys are 6-0-0 to begin the season and haven’t lost a game as a Class C team since the 2014 regional finals.